You may find yourself wondering: how do I choose the best retractable baby gate? The choice depends entirely on your living situation and the way that you’re using it. We’re here to help you find the baby gate that will work for your needs, and we’ve done this by compiling baby gates of all different types and sizes. We’re sure that you’ll find the one that works best for you! Materials: What is the baby gate made of? 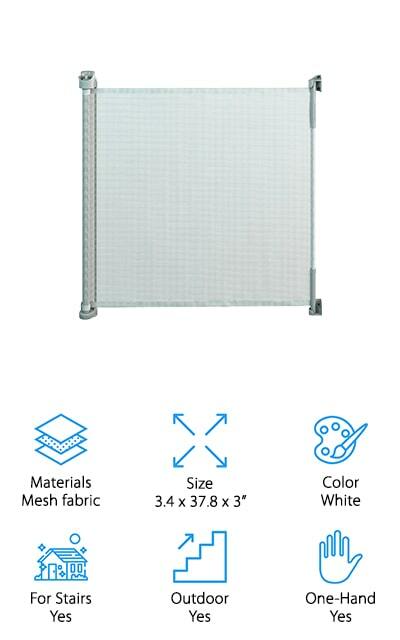 Mesh seems to be the most common material, but there are also plastic baby gates and wooden ones. Choose the one that works best for you and your little ones! Size: We’ll tell you the dimensions of the baby gates here so that you know how big they are. This won’t tell you how far they extend, but we’ll specify that in the description below so you get the best fit. Color: What color is the gate? When you’re choosing a gate, this may or may not matter to you. We’ve included it just in case it does, and so you can make the decision that works best for you! For Stairs: Baby gates that work at the top or bottom of stairs have special hardware that allows them to clip onto banisters and railings for stability. If you use it this way, you should get a stair-specific gate. Outdoor: Can you use the gate outside? We’ll let you know here! Not all retractable baby gates are created equal, so we’ll let you know which are the most durable and can stand up to the weather. One-Hand Operation: Operating the gate with one hand is something that is important for parents. While you’re holding a sleeping or fussy baby, you can’t work a complicated mechanism. We’ll let you know if you can open it easily here. We’ve set out to show you the largest selection of differently-sized baby gates. There might even be a 100-inch retractable baby gate on our list! We want to give you the options that best fit your lifestyle, so we’ve included a little of everything. The top pick and budget pick are highlights, so make sure you check them out first. Then, move on to the other baby gates on our list. Keep your little one safe! Our top pick is a retractable baby gate for stairs that can be used in doorways as well. 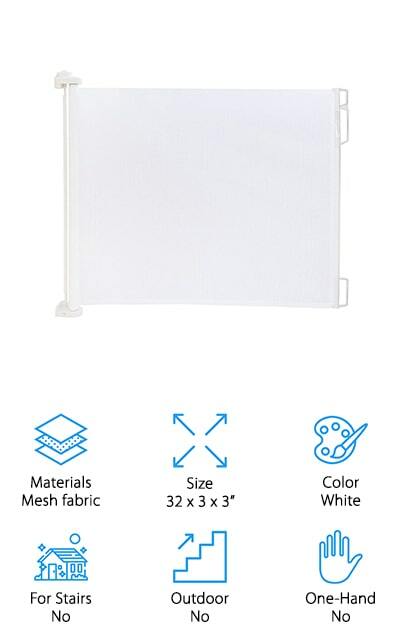 It’s made of a white mesh fabric that you can see through and wash when it gets dirty. You can use it with your kids and also keep cats and dogs out of areas where you don’t want them to be. The mesh is scratch-resistant so they can’t destroy it to get out. There is a childproof lock on the top of the large retractable baby gate, which allows you to close it without your child opening it again. Though this is a long retractable baby gate, it includes a quiet mechanism that you can operate with one hand. That’s perfect for moving your sleeping babies from one room to another without waking them! It includes the mounting brackets and washers you need to install at the top or bottom of your stairs, or set into a doorway! This extra wide retractable baby gate from Evenflo is one of the more affordable options on our list. It’s made of wood and plastic and can be opened from either side with a single hand. At its widest setting, this retractable baby gate (60 inches) will fit into spaces that are too wide for doors. The telescoping safety rail also keeps little fingers safe from pinching. It’s great for high-traffic areas because it’s quick and easy to pass through and open with just one hand. It retracts freely and without too much struggle so that you can get around it in tight spaces without it getting complicated. 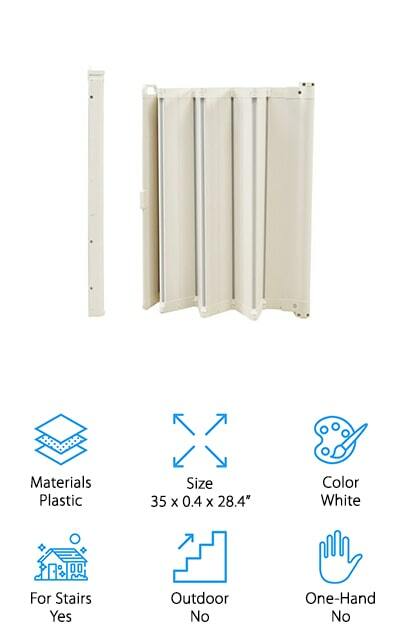 It’s an extra-long retractable baby gate that you can use for pets as well, or anywhere that you need to protect your kids and animals from dangers in other parts of your house. You can install it easily with four-point mounting hardware to make sure that it’s secure! BabyDan makes the Guard Me Gate that is perfect for doorways measuring between 21.7 inches and 35.2 inches. It’s a Flex Gate, so it automatically retracts and folds back to make room when you need to get through with delicate cargo. You can put this retractable baby gate at the top of the stairs or the bottom, and it has all of the hardware to mount on banisters or door frames. If you need a wider gate, you can extend this gate with BabyDan’s gate extensions. 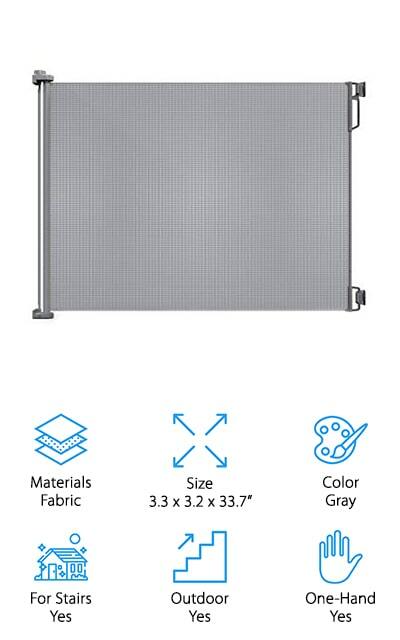 You might even be able to an extra wide retractable baby gate (84 inches). The gate is entirely adjustable and there is no trip bar, which means that it’s fully retractable and you can move it however you need to. We really love the free-moving aspect of this gate, because it’s really great for when you’re moving the kids around. When you don’t need it, it folds back out of sight! Dreambaby makes this retractable gate that you can use both indoors and outside. That’s because the gate is made of a durable mesh that is UV treated so it won’t fade or dry out with sun exposure. We think that’s pretty neat. You can open it with one hand, and it is also space efficient because it retracts out of the way when you need the room. It helps your peace of mind to be able to keep your children and even out of your pets out of harm’s way by stopping them from entering certain parts of the house or yard without supervision. This kit even includes the spacers that you can use to get this extra-large retractable baby gate to stay put in larger spaces. It’s so easy to install that you’re going to want to get one for each of the off-limits parts of your house or outdoor area. We love it! 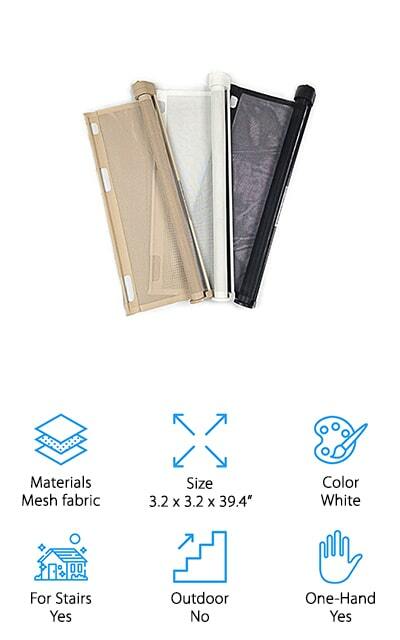 Lascal makes this mesh retractable baby gate that includes brushed aluminum housing for the fabric. That’s classic and beautiful! It’s got a unique timing system that allows it to be opened and operated with a single hand, and there is a red mark indicator when the gate isn’t locked back after you use it. On top of the elegant look, the Kiddyguard has an intuitive design! You can use it at the top of the stairs (6 inches from the top step) and it’s great for doorways up to 48 inches wide. As long as your banisters and rails can allow it to mount properly, you can use it at the top of your stairs. We love the locking mechanism that seems unique to this particular product. It’s easy to install and adapt to just about any sort of situation, and it will look good doing so. We know that this gate will have a place in your elegant home. This wide retractable gate from Gaterol will fit openings between 18 inches and 55 inches, so even the widest of door frames can help protect your family. These gates are taller than some of the other brands on the market because a taller gate means that your baby is less likely to try and climb it. There is no threshold when open, so you won’t trip over it while you’re moving through with delicate cargo. You can install this gate to go at the top or bottom of stairways, outdoors on patios, or in hallways. Use it just about anywhere in that width range for best results. It has two sets of mounting brackets included so that you can use it in two different locations without having to take the mounting parts down. You can operate it easily with one hand, and when you don’t need it, roll it right up and out of your way. This baby gate by The Stair Barrier is extremely easy to install. You can set it up quicker than a pressure mounted retractable baby gate, and that’s something! When you don’t need it, you can roll it to the side out of your way. That alone makes it extremely valuable! The Stair Barrier attaches to any sort of banister or rail so that you can use it at the top of the stairs or the bottom. It uses a buckle system that won’t harm your wood and conforms to the shape of your banister easily enough. Plus, it’s weather resistant so you can use it outside if you’d like. While these barriers are specifically designed for the bottom of the stairs, you can use them at the top or in a doorway. It can even install at an angle, which is infinitely helpful when you have a unique stairway. 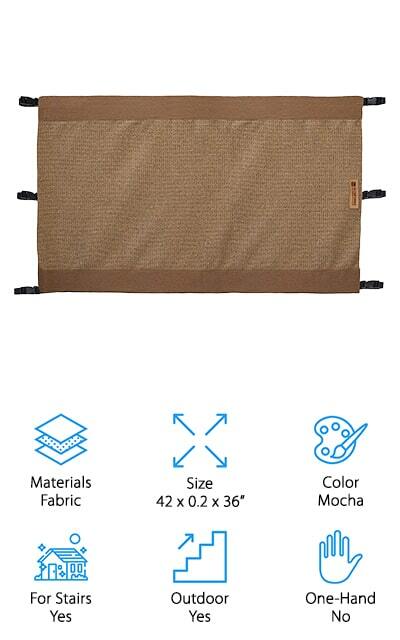 This fabric gate comes in many colors, too! Perma Outdoor makes this retractable baby gate that’s 72 inches wide – or can extend out to that wide to cover all but the largest of spaces. It’s specifically made for outdoor areas, meaning that the fabric is UV treated and can stand up to the weather and your pets’ claws. It’s built to be extremely functional and usable even with one hand while you’re moving things around. It comes with everything you need, too – this large baby gate is 33 inches tall and includes all of the screws, mounts, spacers, and installation guides to make sure you get the best, safest installation possible. It works well as a pet gate as well, keeping all of your little ones safe from dangers in other parts of the yard. 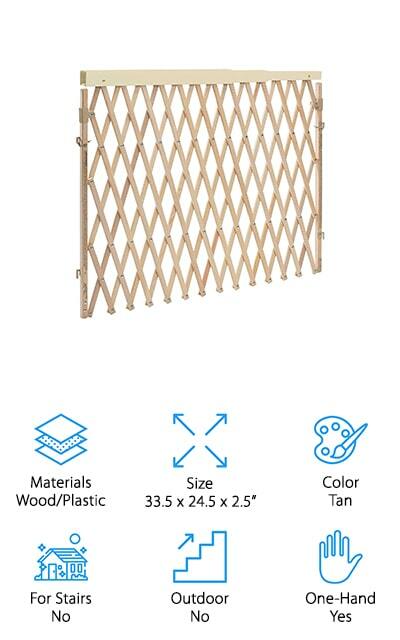 It’s a unique gate on our list as it is specifically meant for outdoor use. We love the locking mechanism that will help keep your entire family safe, too. Little Llama makes this perfectly retractable safety gate that you can use for doorways or stairways up to 54 inches across. When you aren’t using it, it gets out of your way and doesn’t leave behind metal bars to trip over as most walk-through metal gates do. We love that! You can easily take it off of the mounting hardware and move it to a separate set of mounting brackets (which can be purchased separately), meaning that it’s a versatile and portable gate. To open the gate, you must twist the dial to open and pull closed behind you. It’s tough, with see-through mesh that can easily withstand whatever your pets and toddlers can throw at it. We love that you can move it wherever you need it as long as you have additional brackets and that it just folds away when you don’t need it to save space. It’s great for a variety of homes! 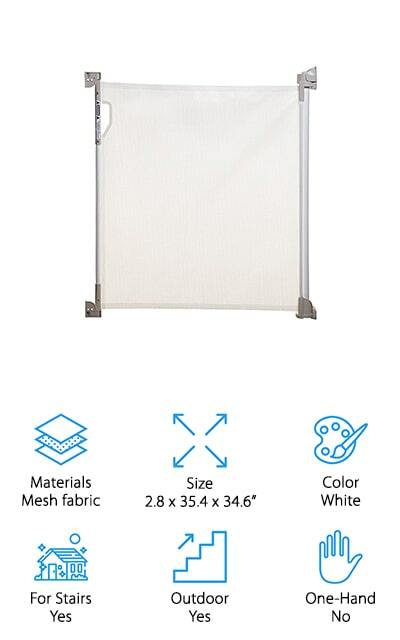 Finally, Bindaboo makes this mesh fabric retractable gate in white. There are other colors available if white doesn’t fit into your décor. 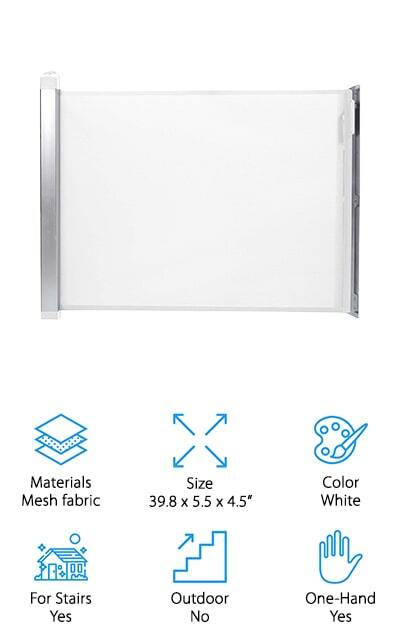 It can fit openings up to 55 inches across, from narrow openings to wider ones. You can use it in your doorways, hallways, and on your stairs for the best results. When you don’t need it, it can retract out of your way so you can move freely between rooms without the inconvenience of a metal trip bar. 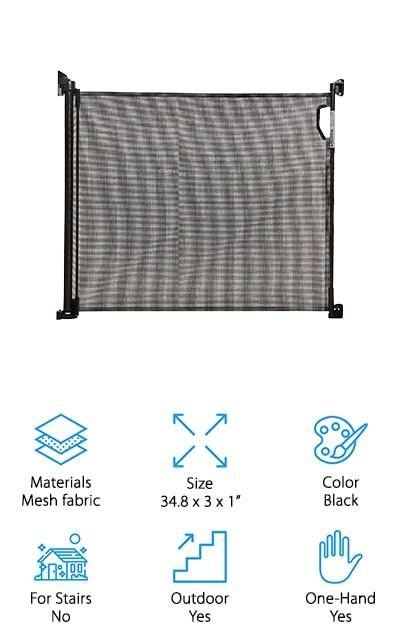 The mesh is durable and great at resisting damage from pets and children. It includes spacers for the moldings along your baseboard and comes with two sets of mounting hardware. You can take the gate off of one mount and put it on another for maximum portability and ease. Plus, it’s super easy to install once you receive it, and you can use it both indoors and outdoors safely! It doesn’t get much better than this.